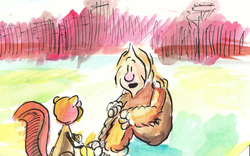 Barefoot is a daily comic strip that I write and draw. Barefoot is the name of the main character. He is gentle and kind, and has a down to earth outlook. He is simple yet deep, and always has time for others. Dr. Science is Barefoot's total opposite. He is an extra-terrestrial that believes he can solve the mysteries of the universe by himself. He is brash and moody. His quest for his own truth is never ending. Barefoot's best friend is a squirrel named Lewis. Lewis is willing to listen to either of his friends, but believes the one who is making the most sense at the time.